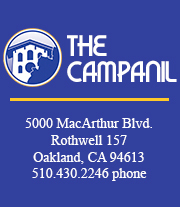 Let The Campanil be the first to say how proud we are that Mills College is located in Oakland. We have written previous editorials opposing Mills’ frequent decision to publicize the location of our campus as the “San Francisco Bay Area” instead of simply stating that we are in Oakland. We run stories and calendar events every issue that highlight exciting, positive and unique aspects of the Oakland community. However, we must also acknowledge there is some truth behind the stereotypes. Several Mills students have been attacked this semester – forced to give up their purses, physically harmed, and left emotionally rattled. Though the issues are decidedly more complex, like many large urban cities economic blight coupled with gang and drug violence has led to personal security concerns in many areas. In the wake of a recent incident blocks from campus that left four Oakland police officers dead, community organizations, citizens and churches have united to overcome such violence. But there are also measures we can take to keep ourselves safe outside campus gates. This does not mean all parts of Oakland are unsafe, or that any particular area should be entirely avoided. And yhe threat of crime should not keep Mills students from being active in our community. We are excited about the possibility of AC Transit bus passes for all students next semester, excited about getting out into Oakland with more ease, exploring and connecting with new neighborhoods, and gaining experience. We also realize media can often sensationalize violent crime and depict struggling cities as uniformly dangerous. Like any story, we know there is more than one side. Oakland is not made up solely of drug dealers and murderers, gangs and car-jackers. While it is difficult to anticipate a crime happening to you, it may make the difference to take some precautionary measures beforehand. A simple safety device is pepper spray, which is completely legal to carry in California without any kind of permit. It can be purchased at any hardware store and some general stores, and it can also be found easily online. California has certain laws that prohibit people from carrying over 2.5 oz of pepper spray, but most containers sold are equal to or lesser than this amount. However, pepper spray is also a dangerous thing to have – it has the possibility of accidentally discharging, and unless carried on your belt, it can take a few seconds to reach into a purse or backpack to find it. Other strategies include avoiding walking alone after dark unless absolutely necessary, letting a loved one or roommate know when to expect you at home, having your keys ready in hand at your home or car door, keeping valuables out of sight on your person and in your car, and throwing your purse or wallet when it is demanded. We also suggest carrying a flashlight – as big as possible -when walking alone in the dark. Whenever someone passes or approaches you, you can turn it on and wave. A huge deterrent to crime is light. Another highly useful precaution to take is a self-defense class. Mills offers “Personal Defense for Women” every semester. In Fall 2009, it will be held from 10 to 10:50 on Tuesdays and Thursdays in Haas Pavilion. The course description states that the class is focused on teaching women useful strategies for handling an attack verbally, physically and emotionally. We believe such skills are important for every woman to learn. It’s the kind of education that can stick with you in a way like no other – it could literally save your life.